What is the scientific origin of the nebular hypothesis of solar system formation? The original nebular hypothesis was first suggested around 1755 by the German philosopher Immanuel Kant (1724–1804), and later advanced by the French mathematician and scientist Pierre-Simon de Laplace. The idea was similar to the current theory of the formation of the Sun, but differed in the way that planets supposedly formed. Laplace suggested that the Sun formed a spinning nebula, and that as the nebula contracted toward the Sun it gave off rings of gas. Material in these orbiting rings then condensed into the planets through collisions and gravitational attraction. This version of the nebular hypothesis was published in Laplace’s 1796 book, Exposition du Systeme du Monde (“The System of the World”). Although it was not correct in its details, it was a strong pioneering effort in pursuing our astrophysical origins. 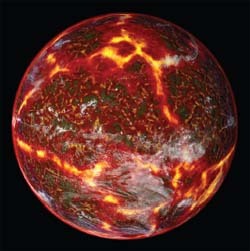 Artist’s depiction of a protoplanet. Protoplanets are relatively large objects in a young solar system that can attract other objects around them to eventually form planets.